To statrt of with we have to acknowledge that the Manduka Eko lite is a very eco-friendly yoga mat, and it is not alone in the product offerings Manduka has. 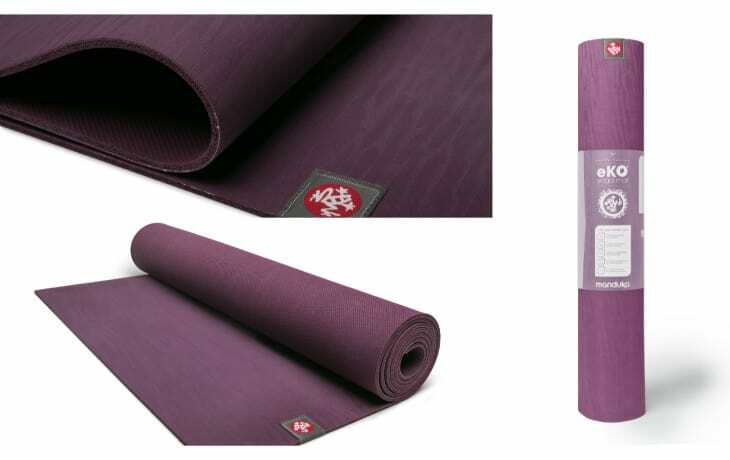 That also includes the Manduka Pro which is another great choice. You can check out our Manduka Pro review too as a comparison to this one as each eko mat has its pros and cons. Manduka is, without a shred of a doubt an amazing company and one of the top manufacturers of yoga mats, clothing and accessories currently available on the market. They ensure no toxic chemicals are used in the creation of the mats and offer a wide variety of natural rubber mats. The company is not only incredibly popular but highly respected, but has received great customer feedback as well as it is focused on manufacturing eco friendly products that are not only durable and reliable, but safe for the environment as well. Additionally, you will learn what details to look for in a superior yoga mat and which are the features a great product of this kind should have. So if you aim to get a high quality mat, keep on reading and see if this one suits you. It might seem like yoga mats are not so complicated to pick, given the fact that their function is pretty basic and that the user does not have to check all the different things it can do. However, given the fact that there are countless brands, models and types of yoga mats out there, the choice has become increasingly difficult. And since it would be completely useless to base your decision exclusively on color and price, here are some features you might want to consider. 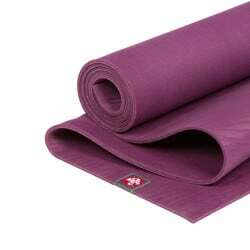 First of all, as it is the case with many other products or product categories, yoga mats can also be somewhat defined by their brand. Believe it or not, the brand of a mat really does say a lot of things about it. For instance, you don’t necessarily need to read an entire Manduka eko lite 4 mm review in order to tell what type of a product it is. You simply need to go through a brand description. You need to understand that no name products will never be able to reach the high quality that well respected companies have managed to reach with their products. Second of all, you need to make sure that the product that you are purchasing is made out of the right kind of materials. You need to check and see if they are eco friendly or toxic in any way and base your decision on that. Last, but not least, every yoga mat should be not only light, but easy to carry around as well. No matter if you are simply carrying the mat to yoga class or if you are a frequent traveler, the mat needs to be comfortable and light! 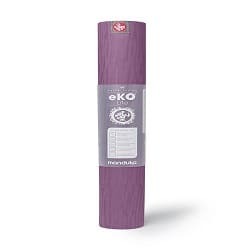 Every Manduka eko lite yoga mat review out there will praise the manufacturer on the high quality of the product. Indeed, it seems that this item really does abide by Manduka’s high quality standards. The mat is made out of natural rubber that has been harvested according to the existing regulations and not from the Amazon rainforest. It is free of any oil based products or toxic materials or plasticizers, foaming agents or PVC. It has an innovative wet grip surface with a unique rippled water platform. On top of that, the 4 mm thickness offers the necessary support regardless of the complexity of your yoga routine. 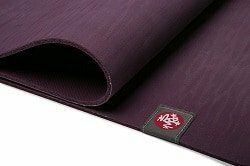 Any Manduka eko lite mat review will state that its main advantage is the manufacturing process and the materials it is made with. It is precisely because of this materials that the mat is safe for use even to those with certain skin sensitivities. 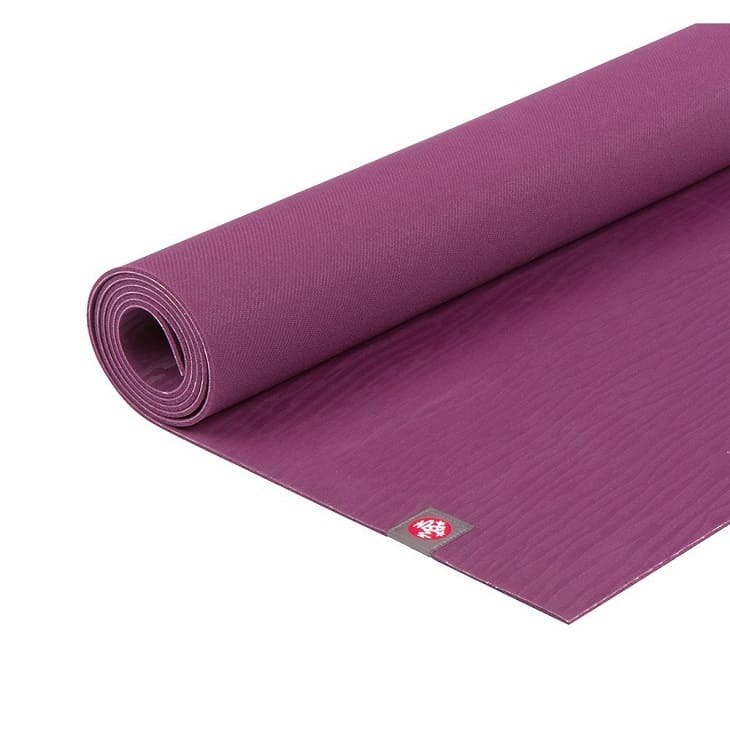 On top of that, the yoga mat is highly durable and incredibly light, which makes it ideal for traveling. And yes you can use it for hot yoga too! The only disadvantage that this mat might have is the fact that it does not have a non slip surface on the bottom. Although it is made out of rubber, in certain conditions and on certain surfaces yogis might feel the need for a more secure practice surface that offers the ideal grip. On top of that, the 4 mm thickness might seem like a lot, but it might not be enough for people who are suffering from sore joints and even arthritis. It also has a strong rubber smell, which fades over time. The bottom line of this Manduka eko lite review is that the product is absolutely fantastic, just as you would expect. We highly recommend this travel mat to anyone needing a mat, as it will suit most people and a variety of applications.